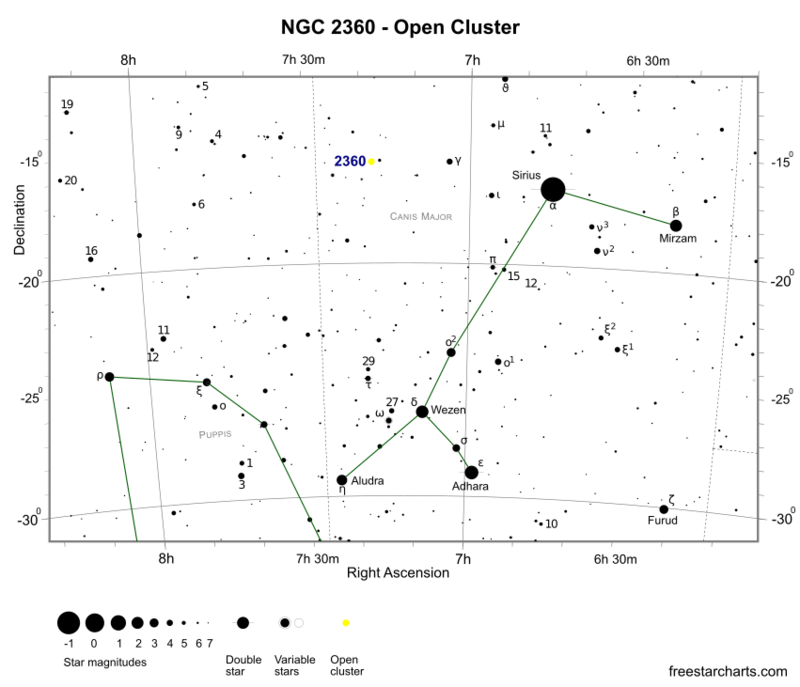 William Herschel included the cluster in his 1786 catalogue of 1,000 clusters, crediting his sister as the discoverer. At magnitude +7.2, NGC 2360 is not visible to the naked eye but is an easy binocular object and a fine sight through small telescopes. The cluster is positioned 8 degrees east-northeast of the brightest star in the night sky Sirius (α CMa - mag. -1.47) and lies 3.5 degrees directly east of gamma CMa (γ CMa - mag. +4.1). At the western edge of NGC 2360 is an unrelated star, HD 56405 (mag. +5.5). 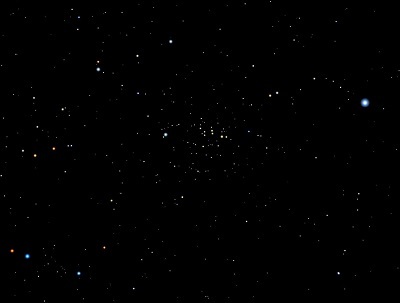 NGC 2360 appears as a smudge of light through 7x50 or 10x50 binoculars with the brightest components just about resolvable. A small 80mm (3.1-inch) refractor reveals tens of stars packed in a rich round grouping, which spans about 14 arc minutes in diameter. This is one cluster that handles high magnifications well, so don't be afraid to push the power up so long as seeing conditions allow. Medium size 150mm (6-inch) and 200mm (8-inch) scopes reveal at least 45 stars, with many of the same colour and about the same brightness. They trace nice arcs and winding paths throughout the cluster. Although not as bright as the nearby Messier open clusters (M41, M46, M47 and M93), NGC 2360 is a fine cluster for all sizes of telescope. NGC 2360 is 3,700 light-years distant and is estimated to be 2.2 billion years old. It's best seen during the months of November, December, January and February.